Pricing is based on a $125 setup fee and $15/week cost. What is a Custom Training Plan? Our 1x Custom Training Plan is best for athletes who want to experience a structured program built for their needs, but who also want to make adjustments independently. You’ll receive a program built around the same systems and processes as our Weekly and Monthly option but the focus will be around short-term improvements (4-8 weeks) instead of long term development. This program is still customized with the initial information gathered during the intake process but any adjustments made will be up to your discretion. Even though this is more of a programming option than a coaching option you will still have access to our Facebook community and have the opportunity to ask questions and be a part of weekly live coaching calls with our staff. Custom Training Plans are built in 4-8-week blocks at which point they may be transitioned into one of our more involved coaching options or rolled into another Custom Plan. Who is this service good for? The 1x Customized Training Plan is best for individuals who want to experience a taste of Virtual Coaching programing without the actual coaching. This service is more centered around programming and is best for individuals who already have experience in the training process and who are 100% autonomous or for individuals who want freedom to change variables as they see fit. 1x Created Plans – Custom training plans are a programming specific service. If you enjoy handling your own training adjustments and aren’t looking for continued coaching outside of the initial consultation this program is for you. Programming Exclusive Service – Custom plans include all of the nuts and bolts of our training plans without the ongoing coaching. This might be a good option for off-season blocks or for general strength plans. This plan is not recommended if you have movement limitations or injuries. Full Athlete Intake – We still build each custom plan from the ground up with the information you provide to us about yourself. We do our best to learn as much about you as possible in the initial consultation to build the most effective program possible. Here Is What Some Of Our Athletes Have To Say About Working With Us. “Over the past couple of years, I have been very fortunate to hit some great numbers on the platform. However, I began to notice my training methods were taking a toll on my body. My mobility was beginning to suffer, I developed more lingering aches and pains, and it was taking longer to recover between workouts. There was simply no longevity in what I was doing, and I knew I needed to make a change. I truly have a passion for Powerlifting. I want to compete for a long time, so I had to make a decision and seek knowledge to grow as a lifter. Joining the Kabuki Strength Team and KS Virtual Coaching has honestly given a rebirth to not only my contest lifts, but my overall health and fitness levels. “My experience with Kabuki Virtual Coaching has been immensely supportive and positive. I chose Kabuki as I needed the flexibility of my own local gym, but the option of working one on one when needed. I was a little hesitant in the beginning because I joined the Virtual Coaching program early on in my powerlifting journey, but I have never felt less than, weak, or insignificant to their stronger or more successful clients. 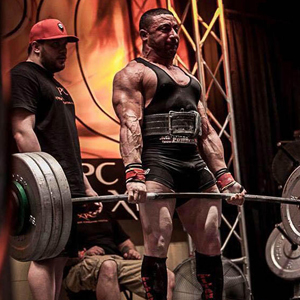 “Being a powerlifter with scoliosis I never experienced any injuries that inhibited my progress. Every day I was getting stronger until a year ago where I injured my back performing squats. I went to multiple PT and chiropractic sessions, but nothing seemed to get me back to full strength. A few months ago, I discovered the Kabuki Strength channel on YouTube. The team not only provided comprehensive and unique tutorials about powerlifting and movement preparation, but also offered online coaching services where clients would have access to a unique plan based on their needs and goals. Needless to say, the Kabuki Strength Team demonstrated that they were more than qualified to assist lifters with recovering from injuries and becoming stronger as a whole. For this reason, I decided to enroll in their coaching roster.